When we left Ottawa on Wednesday, the temperature was 10 degrees (celcius) and the skies were grey, dreary and pouring rain. 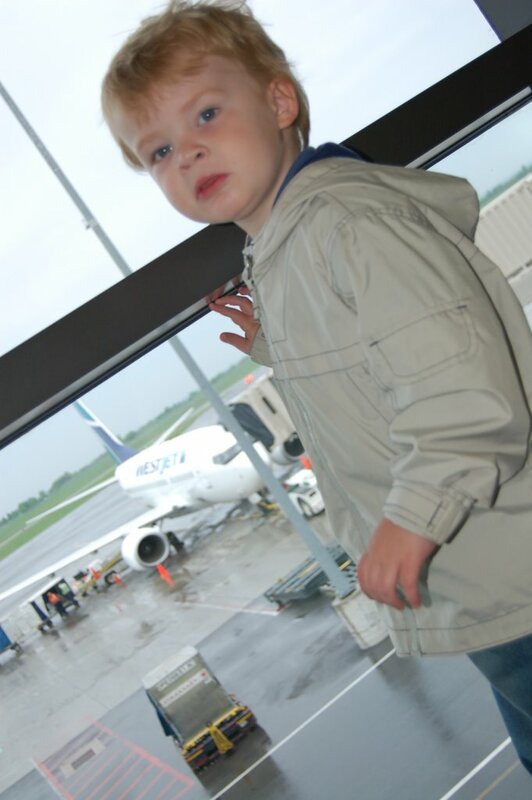 "J" was very excited to be going on an airplane. As I drank my first coffee of the morning, he stood watching the airline employees load up our plane with more coffee, juice and luggage. We took off around 8am and were running almost a half hour ahead of schedule. Our first flight (Ottawa to Calgary) did not have the promised tv's on board. Although I wasn't mad, I will admit that I was a little disappointed. There were quite a few passengers that were not happy at all though and grumbled all the way to Calgary, a good four hour flight. 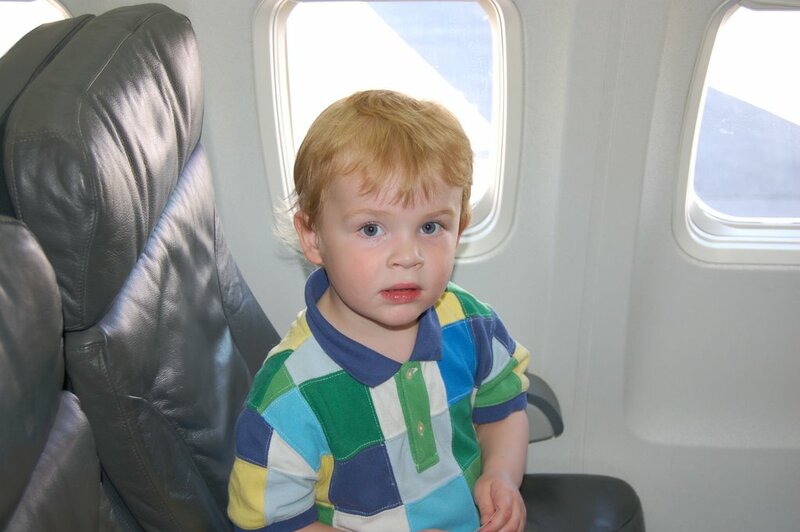 "J" got the coveted window seat and was an awesome traveller. We didn't pull out any of our tricks until absolutely needed, probobly a good hour into the flight. We coloured, stickered (if that is a word), sang songs (quietly of course), counted, had snacks, had lunch, and sat and looked out the window. Halfway through, "J" did ask to go home. He did not want to be on the plane anymore. But a little coaxing and some colouring by me, he was totally distracted and ready to keep going. When the pilot announced that we were arriving in a sunny and hot Calgary, "J" got upset and said he didn't want to go, but when I promised that Opa would be there to meet us he cheered up rather quickly. 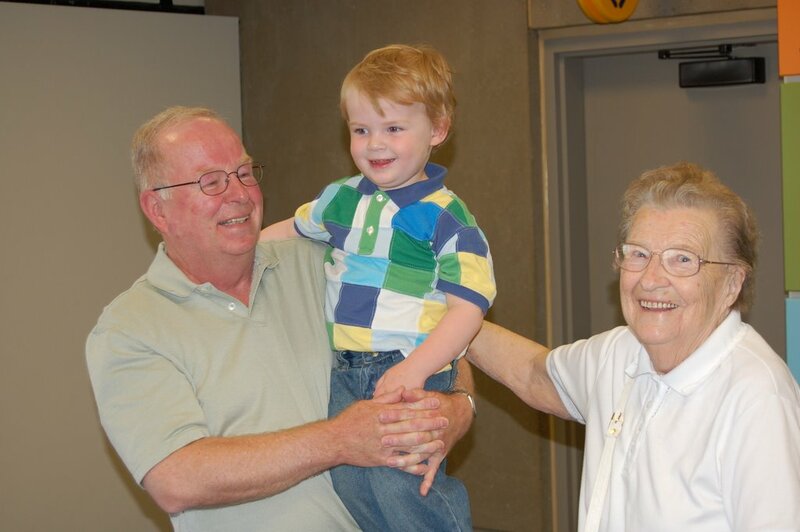 Opa was very excited for "J" to meet Oma, who will be 94 this August. This hour together was very special. Hubby was quite sad that he was not able to be there and worried that we won't have the opportunity to see her again. But, I let him know that Oma told me that she was working hard on reaching 100, so we have a bit more time to visit. Hopefully this winter or spring. Our ride from Calgary to Regina was quick and painless, thanks to TV in the sky. "J" watched "Treehouse" for the hour we were in the air and I got to close my eyes and rest for a bit. We arrived to 30 degrees and sunny in Regina, a quick tour of the city and back to my Sister's for a run through the sprinkler. We have been very busy since we arrived. Our first trip on Thursday was to Tot's Café. I have been waiting three years to go to this café and it was great. It should be manditory in all cities with kids to have a café just like it. My Sister was working on opening one in Ottawa when they got the call to move here, so the plans sit waiting for one of us to pick up on it or for her to return. We also visited my Neices Pre-school, their Church, Starbucks, Dairy Queen, the Saskatchewan Dinosaur Museum (free!! ), a cool Glebe-like neighbourhood with funky stores, a park by the legistature and ... I got to see a movie... I mean a real movie at the Cinema with my Sister. And No Kids!!! We saw "Failure to Launch" a hilarious chick flick, we laughed, we cried, we ate too much popcorn and twizzlers and... we slept in until after 8am as did all the kids!!! So far we are having the best time and we are only halfway through. "J" and I are missing Hubby and the puppies but we all and all we are having lots of fun. Great to hear from you, sounds like you are having a wonderful visit. That is one majorly cute little travelling companion you have there. Glad to hear he fared well on the plane as I knew he would. And how special to meet his Oma, you can see how happy taht little visit made her. WOW I didn't expexct a travel log blog! I'm soo glad you adn j are haveing a great trip. WE HAVE to get together when you get back~!